I had the opportunity to hear Ian Nagoski speak about and play tracks from his recent CD, The Black Mirror: Reflections in Global Music (Dust-to-Digital). Calling it his “mix tape for the world”, the CD contains world music gems Nagoski culled from 78rpm recordings. The selections Ian played were amazing (some not included on the CD, unfortunately) and his commentary was engaging. He provided a capsule history of recorded music touching on topics that remain with us–media conglomerates, planned obsolescence of hardware and media, piracy and bootlegging, how the disembodied sounds of recordings still captivate us… I wish I could have stayed to the end. I did, however, pick up a CD and have been especially enjoying “Nam Nhi-tu” performed by M. Nguyen Van Minh-con and “Smyrneiko Minore” performed by Marika Papagika. It’s been a while since a single CD has offered such a variety of listening surprises. Check out audio samples here. I ran across this very sleek Electronic Musician Emergency Adapter Kit and it inspired me to post my own Gig Survival Kit. I used to carry a similar collection of adapters, but now I only carry a few adapters augmented by a set of tools. tres chic cosmetic bag to carry it all! I began carrying the soldering tools when I started performing with sensor-augmented instruments using the Basic Stamp and I soon realized that they made most of my adapters obsolete. If I needed some strange cable, it was usually possible to make it on the spot. 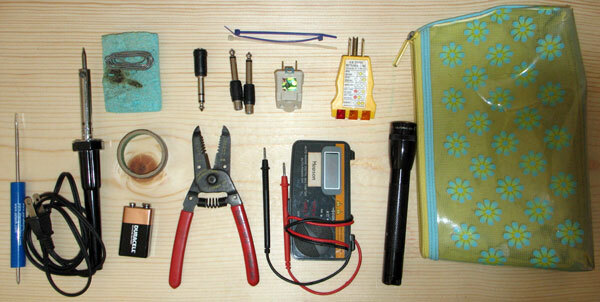 The most often used pieces of kit are definitely the flashlight, the spare battery, and the DI boxes. I’ve had plenty of sour/funny/skeptical/scared looks from the heavy-metal sound guy at the club when I begin unpacking my weirdo electronic gear. Then I pull out my DI boxes and I see expressions of relief and gratitude from the sudden recognition that our gear can now speak a common language. Oh, and the girly-girl cosmetic bag? Simple. It’s free (if you’re male, ask a female friend who wears even a little bit of makeup), it’s unmistakeable which makes easy to find on a dark stage, and it never fails to impress that heavy-metal sound guy. I have now added download links to the audio files in previous posts and pledge to do the same for future audio posts. More bicycling goodness from the New York Times. Apparently, creating a friendly bicycle culture is good for the bicycling business–just look at Portland. The punch line here goes something like “we went for sustainability and got a better economy, too.” No surprise there except that the business activity was noticed at all. After all, bottom line contributions from bike culture industries must be a fraction of other cultural institutions, even in a city like Portland. Not to poo-poo the article, but isn’t part of bicycle culture envisioning a smaller, more local, more easily customized economic reality?Â Its a vision that works great at the Better Business Bureau but that may not have such long legs at City Hall. Regardless…bully for Portland. Oh, did I mention how nice it was to notice great bicycle commuting infrastructure in the Bay Area during my recent visit? 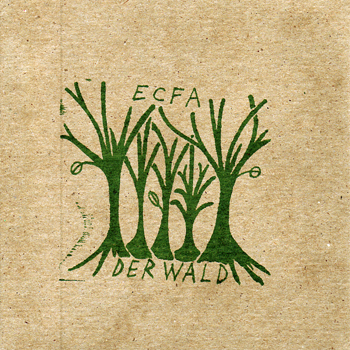 ECFA has released their brand-new CD, Der Wald (2007, Pull The String Records). The lineup for the CD is Carl Smith, tenor saxophone; Holland Hopson, soprano saxophone; and Jason Friederich, drums; with Alex Coke, soprano saxophone on one track. This release features more new music by tenor saxophonist Carl Smith including “Ergeben” and “Schygullaplatz,” both highlights of the recording. Steve Lacy’s tune “The Retreat” is also featured. A few trio improvisations and one solo tenor sax improvisation round out the disc. A nicely varied set of music, much of it with a chamber music feel, and a step up in audio quality from previous ECFA releases. You can get more info and order the CD here.